Sweet carrots with a hint of Irish Whiskey make these a special treat for St. Patrick's day - or all year long. Combine sugar, pepper and salt. Set aside. Heat the oil and half of the butter in a large skillet. Add carrots in a single layer and sprinkle with sugar mixture. Cook over medium-high heat for 3 minutes, then start turning the slices with tongs and reduce heat if necessary. When slightly browned on both sides, transfer to a plate. Clean skillet with paper towels. Add the ginger and cook over medium-high heat for 1-2 minutes, until golden. Add to the carrots on the plate. Add remaining butter, the whiskey and broth. Bring to boil, then simmer 3 minutes or until syrupy. 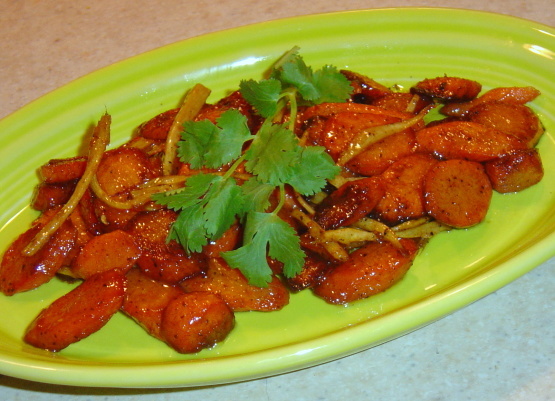 Return carrots and ginger to pan, and swirl with the syrup for 1 minute.